Blaupunkt Velocity 2Go Subwoofer/Boombox | OhGizmo! I have no idea how to pronounce the name Blaupunkt (blow-punked? blop-unk’d? chicken-necks?) but thankfully the company takes a more traditional approach when it comes to naming their hardware. When hooked up to your car the Velocity 2Go serves as a powerful 160W subwoofer and is a convenient way to add a bit of kick to a stock sound system. 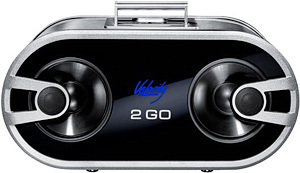 But the Velocity 2Go can also be easily removed from the vehicle and serve as a standalone stereo speaker when connected to an audio source like an MP3 player. There’s a cradle on top that I can only assume will accommodate various iPods but it also includes a 3.5mm cable for those who refuse to conform. And while the speaker is limited to 60W when running on 8AA rechargeable batteries it probably still sounds far better than most of the other portable speakers available on the market. The Blaupunkt Velocity 2Go 6 will set you back about $620 while the slightly smaller Velocity 2Go 5 model is about $515. It is exactly pronounced as in this ad.